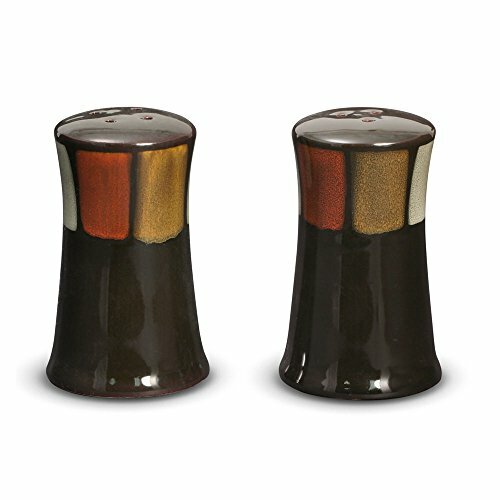 View More In Salt & Pepper Shaker Sets - Page 2. The muted colors of our Taos dinnerware were seemingly snatched from the pueblos of its namesake in New Mexico. Softened by the sun, the shades of khaki, darkened clay, and olive appear like chiseled stones around the edges of the dinner and salad plates and soup/cereal bowl. Crafted of stoneware, featuring a reactive glaze.Due to the nature of reactive glaze, each piece of this handcrafted collection will exhibit unique variations in color and pattern. Allow your guests to add just the right amount of seasoning with our Salt and Pepper Set. A must for every table. Microwave and dishwasher safe. Salt and pepper shakers each measure 3-3/4 inches high.